Back in 2012, when ABC News broke the story of an industrial beef byproduct being secretly added to children’s lunches, the nation was outraged. And a major purveyor of that byproduct, South Dakota-based Beef Products Inc. (BPI), suffered massive losses as a result, which prompted the company to file a lawsuit against ABC News for allegedly defaming its “pink slime” additive, which was previously being added to lower-quality beef products without proper labels. According to reports, the backlash against pink slime was so strong throughout much of the country that BPI was forced to shut down three of its four production plants and lay off over 650 employees. The general public, now aware of a highly processed, ammonia-laced additive hiding in some beef, quickly came to realize that we have all been tricked, ultimately driving all of that potentially contaminated beef product off grocery store shelves and out of fast food restaurants and school cafeterias. So in an attempt to recoup its tremendous losses, BPI is now claiming that ABC News, and specifically anchor Diane Sawyer and correspondents Jim Avila and David Kerley, all of whom delivered the story, somehow defamed and libeled its product, for which $1.2 billion in damages is being sought. And apparently supportive of this malicious attempt at squashing free speech, one of the beacons of honest journalism, are others in the media who seem to have no issue with companies adding cheap filler to beef and still calling it beef. In a recent piece for the neoconservative-leaning National Review, for instance, writer Eliana Johnson begins by discussing the details of the BPI case for her readers but quickly digresses into a series of what appear to be thinly veiled diatribes against ABC News for talking bad about beef, aka having the bravery to report the truth about pink slime. Seemingly defensive of BPI and pink slime, Johnson unearths a series of words and other nuances expressed by ABC News during its multiple aired segments on the additive, each of which seems to have been dredged up for one purpose: to paint the network in a negative light. Johnson goes on to highlight other points about ABC News that she apparently hopes will sway even more reading minds against inconvenient, but honest, journalism. 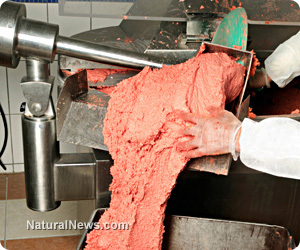 Despite what BPI and other industry insiders might claim about pink slime being nothing more than simple beef, the fact of the matter is that it is a highly processed beef byproduct that may contain inordinate amounts of toxic ammonia due to its manufacturing. And ABC News drawing attention to this fact, which has naturally resulted in the public rejecting this inferior product in favor of the real thing, can hardly be considered a crime. Meanwhile, ABC News is challenging the suit and calling on Circuit Judge Cheryle Gering to dismiss it entirely. The Center for Science in the Public Interest, a public advocacy group, is also supportive of the case being dismissed on the grounds that ABC News was merely exercising its First Amendment rights.